Why did the VMware instructor take the Hyper-V training course? If you run a VMware environment, it's understandable to be skeptical of Hyper-V. But as one VMware instructor decided, you shouldn't knock it 'til you try it. My IT career has been dominated by VMware technologies, at least when it comes to virtualization. I thought I was long overdue to spread my wings and take a look at life on the other side of the fence. So this year I've been investing in my skills to become more of a virtualization guy than a VMware-one-trick-pony! Very kindly, Microsoft let me attend its four-day fast-track course. Now you might think that as a VMware die-hard, I was the student from hell -- but I went into the whole deal with avowed determination to be open-minded, and actively look for things that Microsoft either does better or has a different take on. Of course, there are differences and I think it's critical for all of us to be more aware of the options available to the business which we serve. In this series, you will read about what I liked of the course, and what I like about Hyper-V and System Center Virtual Machine Manager (SCVMM) 2008. I don't let Microsoft off the hook entirely, so I hope everyone finds this series fair and balanced. I think the key takeaway for VMware admins is knowing that VMware is far from perfect, but that there is palpable gap between VMware and Microsoft virtualization technologies. VMware guys like me have had it easy for sometime because we picked the market leader, but it's a safe wager that you will find yourselves more and more frequently asked to explain why the business should use one technology instead of another – especially if the other is cheaper. Dipping your toes in foreign waters is the ideal place to begin. The Hyper-V training course was an amalgam of two courses, 6422A: Implementing and Managing Windows Server 2008 Hyper-V, and 6331A: Deploying and Managing Microsoft System Center Virtual Machine Manager), which are both based on Windows 2008 R1. These two courses were combined to make a four-day event, and the training company added R2 content to the PowerPoint slides to make the course as up-to-date as possible. In my class, we used Windows 2008 R2. There's often a lag between product release and course availability, so I'm grateful to Microsoft and the training company involved for making this event happen with the most up-to-date technologies. Overall, the course was good, and I would recommend it. The setup of the course, however, didn't always facilitate the use of all the features of Hyper-V and SCVMM in student labs. There was no access to shared or "abstracted" storage, which limited us to instructor demonstrations of certain Windows 2008 R2 technologies such as Live Migration and Cluster Shared Volumes (CSV). In fact, Hyper-V ran from PCs in the classroom that were cloned and disconnected from the network to avoid Network Basic Input/Output System and IP conflicts. In VMware classes, I'm used to having access to a remote lab environment called the Virtual Data Center (VDC) with real servers connected to Fibre Channel, iSCSI and Network File System storage. I suppose Microsoft might have difficulties rolling out a Hyper-V training course that comes with relatively high hardware requirements, as with a VDC-based environment. There is a very large number of Microsoft Training Partners -- which vary in size, scale and location -- and it would be difficult to implement VDC-like standards across the board. This takes me back to my days as a Microsoft Certified Trainer (MCT). I remember that it was tricky to gain access to high-level hardware for the clustering course in NT4. I imagine this is something that Microsoft will work with its training partners to resolve. The Hyper-V-based PC also served as a SQL Server, System Center Operation Manager (SCOM) and SCVMM server, though these roles run in the "parent partition," separate from the Hyper-V hypervisor.. Unfortunately, I think that this setup reinforced an incorrect view that Hyper-V is a "host-based" solution, rather than a bare-metal hypervisor. The Hyper-V feature was enabled as a role within a full install of Windows 2008 R2, and sadly, this created the impression that Hyper-V was more like Microsoft Virtual Server. I think the course could be made more realistic with a dedicated Hyper-V server -- it is, after all,. what Microsoft recommends for production environments. In the interest of making my criticisms construtive, I talked with the trainer about how each student pair could use a two-node Hyper-V cluster involving a third PC configured with OpenFiler, StarWind or something similar. Alternatively, a more VDC-like setup could have been created, and Hyper-V could have been enabled on the Windows 2008 Server Core edition using the 'ocsetup Microsoft-Hyper-V' command. 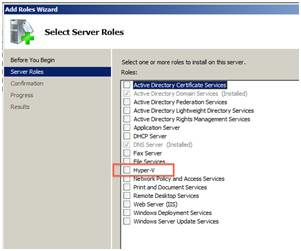 Instead, Hyper-V was enabled alongside other roles in Windows 2008 R2. The perception that Hyper-V is more of a "hosted" virtualization solution rather than a dedicated hypervisor is evident in some of the virtual machine (VM) networking. 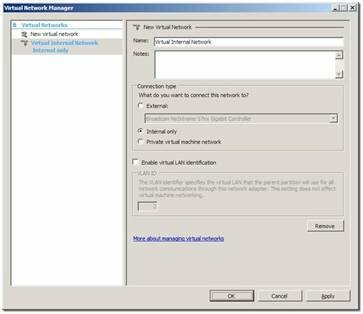 An "internal" network in Hyper-V, for example, would allow a VM to speak to the hypervisor and other VMs but not to the outside world. Although this configuration is certainly possible in the realm of VMware ESX, it's generally frowned upon because of security and performance reasons. To be fair, VMware's ESX server defaults to creating a "VM Network" port group on the same vSwitch used by management. I guess all vendors struggle with their out-of-the-box defaults. There's a compromise between getting the customer up and running, and ensuring best practices are followed. Throughout the rest of this series, I'll be discussing my experience at the course with a four-pronged strategy. First, I want to draw your attention to some Hyper-V features that I actually find quite interesting. On a high level, I'll outline some of the major deficiencies within Hyper-V and SCVMM. I'll do a blow-by-blow comparison of Microsoft and VMware. I will be as detailed as possible, based on my attendance at the Hyper-V training course and deep knowledge of VMware products. I'll discuss how the Microsoft solution differs from not only VMware but also other vendors. Despite the overall critique of Hyper-V, I think it's fair to say that Windows 2008 R2 is a step up from its predecessor (e.g., support for 64 logical processors and 1 TB of memory). Additionally, the removal of some painful restrictions -- such as lifting the limit of one VM per logical unit number/volume -- must be a welcome improvement for customers using Hyper-V.